We’ll take a look at turn based battles, factions and add the first battle to the game. Turn based battles are a classic battle system in RPGs – in a turn based battle, each combatant can perform an action per turn. The order in which the combatants can perform their actions is based on a turn calculation (usually through a formula, using status values of the combatants, e.g. AGI). First, we’ll take a look at the battle system settings for turn based battles. Open the ORK Framework editor and navigate to Battle System > Turn Based Battles. Change the following settings. This settings only affect turn based battles – active time and real time battles have their own settings. For now, we’ll go with strictly turn based battles. All battle actions of a turn will be selected at the start of the turn and performed after all actions have been chosen. If enabled, the turn based battles would allow multiple actions at the same time, breaking down the strict turn based battle order. This is our formula which will calculate the order of the turns. These settings define how the player control will be handled during turn based battles – i.e. when the player can be moved around. The player control will be blocked during the whole battle. The player control will be blocked while displaying battle menus. These settings define how the camera control will be handled during turn based battles. The camera control will be blocked during the whole battle. This will allow us to use camera steps in battle events. This setting determines if Move AIs can be used during turn based battles. We’re not using Move AI yet, and we don’t want to use it in turn based battles. That’s it for the turn based battle settings. Factions define if a combatant is an enemy or ally of the player. You can learn more about factions in this how-to. That’s it for the factions, but we will check if the player faction is set correctly. Navigate to Game > Game Settings. Make sure that the Player faction is selected as Default Faction (found in Player/Group Settings). Our work in the editor is done for now – click on Save Settings and close the ORK Framework editor. Now it’s finally time to add our first battle to the game – we’ll add it to the field scene, so open 2 Field (found in Assets/Tutorial Resources/Scenes). In the scene, navigate the view to the town entrance (where we placed our scene changer) and use the ORK Scene Wizard to add a battle to the scene: Create Object > Battle > Turn Based Battle. 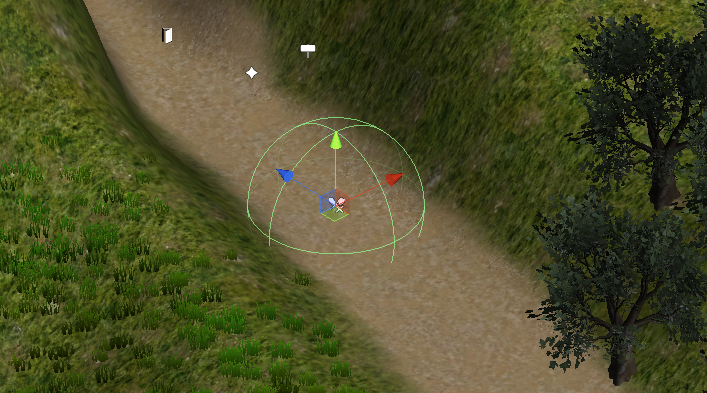 Move the battle’s game object a little bit down the road, so that the player will have to walk a bit before starting the battle. The state of the battle (if already fought or not) is automatically handled by ORK Framework – the battle receives a Scene ID when added to your Unity® scene, when the player finishes the battle, the scene ID is stored and saved with a save game. As long as the battle isn’t bound to any special occurrence (like the player has to accept a quest first) there is no need for you to use game variables to remember fought battles. We want the battle to start when the player walks into it’s trigger (collider). Since we used the scene wizard to create our battle, most of the settings are already correct. In the Battle Component‘s inspector, change the following settings. Enable this setting (it should already be enabled). When you don’t want ORK to remember the battle’s state, simply disable this setting and the battle will reappear each time you enter the scene. Set to 0 (it should automatically receive this ID). This should already be selected, since we used the scene wizard to add a turn based battle. We wont run from our first fight! This will make the combatants look at their opponents at the start of the battle. The battle will start when the player enter’s the trigger of the object. This setting determines who the player will fight in this battle. For our first battle, we’ll fight a single Evil Pants. A combatant/group is already added to the battle by default, so let’s change it’s settings. If the selected faction is an ally of the player, there will be no fight. We want to fight a single combatant, and haven’t set up combatant groups yet. We want to use the combatant’s default class level from his settings. And that’s it. The rest of the settings would allow us to override the default battle spots, start/end events and other things that we don’t need for now. The enemy is hovering in the air. The enemy just pops up. There is no feedback on damage or things like that. That’s because we didn’t set those things up yet. We’ll fix the hovering enemy for now – the rest will be covered in the next tutorials. Let’s place the battle spots on the ground – open the ORK Framework editor and navigate to Battle System > Battle Spots. Change the following settings. This determines the layer(s) that will be checked when doing a raycast to find the ground below a battle spot. The scene’s terrain should be placed in the Default layer. Keep in mind that other things (like colliders/triggers) should be placed on a different layer, e.g. Ignore Raycast. Now the battle spots will be placed on the ground, and your combatants with them. And that’s it for now – the next lesson will cover damage/refresh flying texts.